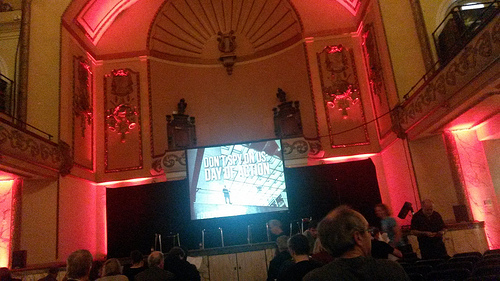 I was at #Dontspyonus day of action earlier today. Since it was more of a conference than a demo, one of the more comfortable I have been on. The plenary sessions were noted at this article at Liberal Democrat Voice. Apart from its cynical LibDem sectarianism, it’s reasonably accurate and gives a good flavour of the speeches made in the plenary sessions, particularly Alan Rusbridger & Cory Doctorow. Alan Walpole presents his report on his blog here. Doctorow repeated his shtick that DRM is software vulnerability, and that the prohibition on circumventing DRM is the thin edge of the goal of banning IT security research. Two comments I’d add, the first provoked by Richard Aldritch is that when studying GCHQ’s involvement in the global surveillance machine, you should look at the mandatory de-unionisaton that occurred in 1984. Today there is a debate outside Government about the legality of the actions of the security services; there can be little doubt that the lack of Union protection makes whistle blowing more dangerous. It also removed a place people could safely discuss the morality and legality of what they were asked to do with workplace colleagues and obtain independent legal advice. Also just to note, one of the sources of power of #dontspyonus is its incubation from a variety of civic society organisations such as English Pen. Once again, it’s taken months to get this up, provoked by a desire to post on one of the seminars, coming shortly. Backdated to the day of occurrence. The in line picture is mine @flickr, with the usual CC BY-SA, the featured picture is from English Pen.